I could not let January pass without noting that the Personal Computer is now 30 years old. (Note: Not the IBM PC, that johnnie-come-lately didn't come on the scene for another six years. Personal Computer was an existing industry term, co-opted by big blue. In a striking prophetic act, they Trademarked the name...) MrGadgets, along with the rest of the world, became aware of this device when it appeared in an article in the January 1975 edition of Popular Electronics. The Altair is recognized by most as the first true personal computer. More information here: http://oldcomputers.net/altair.html. There is an article here: http://wwwcsif.cs.ucdavis.edu/~csclub/museum/items/mits_altair_8800.html. (Note the EIGHT INCH floppy drive. I think I still have some 8" media buried upstairs.) Also check out Tom Sanderson's Virtual Altair Museum. This, boys and girls is the progenitor, the one that started it all. Lest you under-estimate the importance of the Altair, you still can see it's influence on the modern technological world. Upon seeing the article, Bill Gates and Paul Allen saw an opportunity. They DROPPED out of HARVARD and moved to NM to write Altair BASIC. Also worth noting, MITS didn't really intend to start the Micro-Computer revolution. What then? The clue lies in the name: Micro Instrumentation Telemetry Systems. What kind of telemetry? Model Rockets, of course. "There will be no turbans in the government. Everyone agrees on that." - ADNAN ALI, on an agreement among Shiite leaders that Iraq's new government should be run by lay people, not Islamic clerics. "I want to vote, but as you can see, the situation is getting worse. We see these leaflets every day." - KHALIDAYAH LAZEM, a Sunni Arab, on insurgents' warnings of violence against Iraqi voters. "Election, that's the best weapon for us. Terrorists, they use car bombs. We use the election." - DIAA AL-TAMIMI, an Iraqi expatriate who voted yesterday in Skokie, Ill.
"A hundred names on the ballot are better than one, because it means that we are free." - FADILA SALEH, an Iraqi voter. Today, I went to traveled to the neighboring School District to judge a Novice Forensics Tournament. The Hickman Mills School District has a long history. Hickman's Mill was along the Santa Fe Trail and was one area of Missouri where the Red-Leg JayHawkers raided during the civil war. These raids were a pre-cursor to the trip by the James' and Youngers' with Col. Quantrell over to Lawrence, but that's another story. It was also the first Missouri School District to Consolidate back in 1902. My mother taught Fifth grade in the district before she retired, and my wife started her teaching career there and spent thirty+ years teaching English, Speech and establishing the Gifted program before moving to the next district over (Center) to take a administration job. This connection to the Speech department has led to one or both of us adjudicating over our married life. I have avoided judging Debate all these years, as I felt unqualified. I was never in Forensics in high-school, but was acquainted with most and friends with several of the participants. I have enjoyed Lincoln-Douglas on a couple of occasions when the organizers have 'mistakenley' assigned me the task, but, to me, Debate was serious business. This time around was different, in more ways than one. I had two rounds assigned, the first was Student Congress. I found it quite interesting, it was a mock congressional session, with student participants giving speeches for and against proposed legislation. Of course, they were Novices, and it showed, but it was really a blast. Banning Alcohol at Sporting Events. The biggest problem was they didn't quite sound convincing enough. RESOLVED THAT THE UNITED STATES FEDERAL GOVERNMENT SHOULD ESTABLISH A FOREIGN POLICY SUBSTANTIALLY INCREASING ITS SUPPORT OF UNITED NATIONS PEACEKEEPING OPERATIONS. I must admit it took even more effort to not let my personal opinion influence my judging and concentrate on the skills of the speakers and the efficacy of their interchange. I don't know if it was the in-experience of the participants, or the new fashion, but at least one could follow the arguments. Besides my lack of expertise in the debating art, one of my other motivations for eschewing Debate rounds is the style change I noticed over time. I have often had to restrain from making an announcement that I did NOT subscribe to the (S)He-who-talks-fastest-wins school has never been a personal favorite. I know we are under time constraints here, but if I can't follow your argument, in my mind you LOSE, know matter how cogent it might be. Once change I found disconcerting was the influence of technology on process. Back in the day, citations were hand-copied onto index cards. Now, the participants carried standard 8.5 x 11 in. sheets of paper. Such are not as practical in either making arguments, nor finding citations during cross. The paper is just too flimsy. Plus, I know from experience, that copying something by had is as much a memory-exercise as it is a way to transfer the data into portable form. In short, I believe my pre-computing peers were better debaters because they had better INFORMATION at their fingertips. And the very method of compiling their source data was part of the process of transforming into information. At one point the young man on the affirmative side cited two definitions, from dictionary.com. Would it have KILLED him to walk into a library and find a Webster's? I did note that the participants still cross with their flows on legal pads turned sideways. Score one for traditional! Note to debaters and their coaches: If you are going to be using well known news events in your arguments, you really should make sure you pronounce the names of locations and groups involved properly. In spite of all MY Kvetching, it was a pleasant day of service to the intellectual development of America's future. January 25th brings the grand Scottish tradition of Burns Night. As with all things Scottish, it is a great tradition. As everything else is CRAP!, we shall, of course, give the grand night it's just due. On this day, January 24 or the Year of our Lord, 1984 the Macintosh was released, and personal computing was changed in ways we barely even understand, even today. Don't believe me? Once I figure out that the Ctrl key in WindoZ is the same as the Command key on the Mac, and the Mac Option key is pretty much the Alt key in Redmond's copy-cat world, I could transport from 1984 directly to today and wouldn't need a manual. I guess it should not be surprising how long it took, Redmond didn't use their normal method of buying a solution. There is a nice site that Chronicles the Mac's creation. Andy Hertzfeild, one of the original designers, has written a book on his recolections of the process. Read some of the stories and history, if you are not familiar. In a world where the PC is barely beyond a beige-box mentality, it seems strange. Treating a technolgy device as a work of art. Applying as much the aesthetic as the innovative in an elegant total design. This has always been the forte at Apple. I have been asked by more than one musician why I didn't persue a musical career full-time. In the early days, those of us who saw the future of technology could see the revolution. 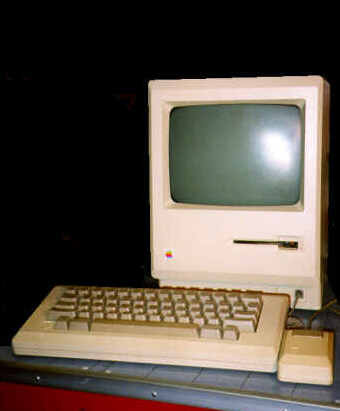 As Andy's title indicates, the Mac embodied that revolution. Apple has stumbled, but not quite fallen. It has managed a nice recovery from the brink. Many of my friends in the Ameteur Radio community were dumb-founded with my Mac-using habits. I never saw Apples demise as a good thing, even when a new job took me away from daily usage of their product. Who else would be the burr under Mr. Bill's saddle? Whatever it's faults, and they are legion, Apple has prodded the rest of the industry in so many ways, and continues to do so. To that end, my oldest friend recently asked my thoughts on the new Mac Mini. It is, by far, the smallest system, bar none. WindoZ or Mac. And don't it just look COOL? The week started out quite nicely, with a family friend's call on Monday. (A Holiday to boot...) Instead of my attempting to drag her ancient (in dog years) Compaq system into the new millennium and install DSL, she wanted to purchase a new setup. Off to purchase a new laptop, WiFi Access Point, Network-ready printer (WiFi or Ethernet), USB key-fob, Microsoft Office, etc. 1. SBC/Yahoo DSL disk install. A-OK, create account, connects fine w) laptop-to-DSL Modem. 2. Connect AP/Router/Firewall to Modem. Connect to Access Point. Everything fine. By now I have lost track of how many times I have re-booted. 4. Run printer driver installation program while connected to printer by Ethernet cable. Wizard sets up WiFi connection from printer to AP. Printer drivers install. Wants to boot in safe-mode. Eventually accept last known good configuration. Windows XP (SP2) boots, shows desktop for about two seconds, then that stops and the only application running is Norton Anti-Virus. I repeat the reboot process numerous time. At one point, in fact, I successfully run the Norton Update. It connects to the site, through the AP and updates, pretty as you please. I return the whole mess (sans printer) to the retailer on Tues. @ noon. The young Squadsman assures me, in his geek-smugness, that he won't even have to check it in, just run a quick non-destructive recovery. I said I would leave it. I call @ 4:30, as they have not contacted me. "Oh yeah, we are just finishing up, it should be ready by 5:00"
Hah! At least some vindication. Left her working on a Word document. Thurs. Can't get to the outside world, although I can see the printer just fine. It wants to boot in Safe-Mode. Same exact scenario as Monday. I went with my friend, everything in tow this time and explained what had happened. Spoke w) the Geek Squadron-leader. Learned about what I had done wrong, vis-a-vis the DSL modem. I left her to deal with the manager about installs, fees for same or returns. I could probably have patched the whole kit together just fine, but will never know for sure. The Squad sent a pleasant young Geek to get everything functioning this afternoon. NEVER run the DSL install wizard! It should NOT be this HARD. If I can't do this, it's for DAMN sure the average customer will be out of their depth. We go to the store and purchase thousands of dollars of equipment and then spend hours of time with on-line or phone support getting it to all work together. Admittedly, if it were easy, I would be out of a job. Well, I would probably be gainfully employed MAKING it easy, but you get the idea. But, in the end, It should NOT be this HARD. Just how short an attention-span do they think we have? This morning I heard a radio spot promoing Alias, with the delectable Jennifer Garner. "From the producers of Desperate Housewives..."
OK, so a lot of people thought Season 3 was on the weak side, and the season debut is 3 months late, but come ON! The real question is, do they know something I/we don't? Just how short is the attention-span of the American mass-media consumer? God Loves You in Spite of Your Past. God Will Save You in Spite of Your Sins. God Will Use You in Spite of Your Failures. KC rated No. 17, if I remember correctly. For the record, Mr. Gadgets did well in this regard for 2004 (Admittedly, all the weight came off in the first half of the year, with the time since the NYC theater vacation week in 'holding-pattern' mode. At least mostly so.) I lost well over 10% of my body-weight, but less than 15%. I need to re-start the downward path. ANYWAY, each Friday, the Silver Spoon, the Breakfast/Lunch cafe on the ground floor of my building, brings in Lamar's doughnuts. Only in the first few weeks of January do these delicacies last past 9:00am. Usually there are fewer and fewer left at this late hour as the month goes on, with the first Friday in Feb. finding us back to normal operations, i.e. get there early to get insulin-shock. In German: Heilige Drei Könige. In Spanish: el Dia de los Tres Reyes, la Fiesta de Reyes, or el Dia de los Reyes Magos. Translation: Three King's Day, also known as Epiphany. Many Christian traditions have the visit of the wise men occurring on this day. The wise men have been on my mind more this season than recent years. Just as ballet has "The Nutcracker", so opera has a special piece for children at Christmas: Amahl and the Night Visitors. They determined that one of the King's MUST be hard of hearing. Years later, while writing his opera, half of Kaspar's lines seemed to be: "Eh?" Whenever I see a creche, with the king's depicted in all their glory at the humble beginnings of the King of Kings, their is always one with a chest of jewels. To most, this is the king bearing gold. To me, it is gentle old Kaspar, with his box of magic stones. I never travel without my box. Black string Licorice! Black string Licorice! One last chance to say, Merry Christmas! there's a finger I can't bend. ain't nothin' to the way you left me cold. But THIS wind cuts right through my soul. My NEW New Year's Resolution - What's Yours?